Send or hand out champagne die cards to customers and announce the party’s at your place this year. 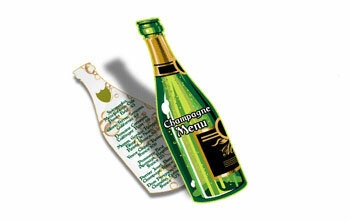 The shape of these bottle die cut cards makes your promotional message loud and clear. Measuring 3.75" x 10.75", these full color cards are printed on 14pt ultra-thick cardstock. You can print in full color on both sides, or leave the other side blank if you wish. Custom die cutting is a simple but effective way of getting customers’ attention. Use champagne die cards for your New Year’s Eve marketing and bring in a crowd that’s prepared to party. We offer several quick turnaround options, even during the busy holiday season. Champagne bottle die cut is 3.75" x 10.75"
Let customers know they can come pop the cork at your place of business with champagne die cards. They’re great for New Year’s Eve marketing as well as for special events such as weddings, anniversaries, and other celebrations. Our custom die cutting makes it crystal clear you’re serving the bubbly! Just click on the bottle die cut in our template gallery to open it in our online design center. Then use our online tools to customize the design with your logo and message. Even people who rarely drink or only drink socially cut loose with the tab on New Year’s Eve. Bring in that extra drinks revenue with a fun promotion! Many people don’t decide where they’re going to celebrate New Year’s Eve until the last minute. That leaves you an opening to suggest your business as the best place to be when the ball drops. Entice customers with special prices or one-night-only menu items. Make it special and then pack them in!